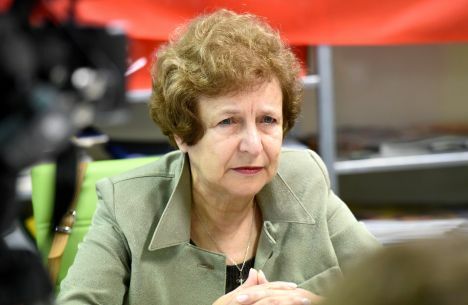 Corruption Prevention and Combating Bureau has decided to not pay Tatyaja Zhdanok’s party Latvian Russians Union the confirmed state budget funding. CPCB made the decision to not pay state budget funding to the party’s stated bank account because it is not in a Latvia-based credit institution. If the party opens an account in a bank registered in Latvia, funding will be provided, CPCB explains. Zhanok says shortly after elections her party turned to 15 Latvia-based credit institutions with a request to open a bank account to receive state funding. Although no response was received from most banks, three of them – Swedbank, Citadele and Luminor – have decided to reject the party’s request, said Zhdanok, adding that the reasons for the decline were not explained. Zhdanok promises to appeal CPCB’s decision. She stressed that the current law has a collision, because the requirement for political organizations to open accounts in Latvia-based credit institutions is not binding for banks. The party’s leader reminds that in spring her party tried opening an account in one of the banks registered in Latvia, but «all major banks declined». The party had turned to CPCB, Finance and Capital Market Commission, as Consumer Rights Protection Centre. Seeing no solution, the party opened an account in Lithuania’s Paysera credit institution. According to the law, to receive state budget funding, the party is required to open an account in a bank registered in Latvia. CPCB’s decision can be appealed in accordance with the Administrative Process Law. This year, LRU was eligible for EUR 19,179. The total funding for the next four years is EUR 76,716, according to information compiled by LETA. In accordance with the law, state budget funding is provided to parties that had received more than 2% of votes in previous Saeima elections. Each calendar year parties are paid 71 cents per every vote. State budget funding is provided for four years. Money is paid starting year after Saeima elections. In the 13th Saeima elections, a total of ten parties and party unions had passed the 2% barrier.